In the 1960s, UK Prime Minister Harold Wilson urged the nation to embrace the “white heat of scientific revolution”. House designs may have made a superficial nod to modernity, but the scientific revolution did not bring much building physics into the domestic sphere. As those of us who grew up in them can testify, the houses of the time were often freezing. When Martin and Brigitte Sims decided to move out of central London, the house they bought was no exception. A typical 60s detached house, it had been improved little since its construction. Some of the windows had been double-glazed and some of the cavity walls had been insulated, but others had not been touched. None of these measures had made a lot of difference; the house was still, “an absolute icebox”. 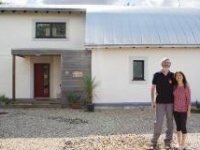 However the couple were prepared for this — as a German-trained energy assessor, Brigitte Sims knew that pretty much any house they bought in the UK would be in need of radical retrofit to make it comfortable and energy efficient. While the house was cold and unappealing, it had everything else the Sims were looking for: a wonderful garden of 1.6 acres, including an acre of unmanaged woodland – enough to produce enough wood to be self-sufficient in heating fuel – and still ample space for growing their own fruit and vegetables. The roof faced due south, ideal for photovoltaic generation, and the house was structurally sound enough to take an extensive retrofit. Martin and Brigitte contacted Paul Mallion of Conker Conservation to help them transform the house. Paul drew up plans for a comprehensive retrofit, to include much improved airtightness and ventilation, external insulation, and all new doors and windows (including new openings to increase solar gain, daylight, and views to the garden). The project also included converting a garage into an accessible annexe for parents, and building an extension above to add a bedroom. The south-facing living room was also extended, creating a sunspace at the front. MVHR ruled out aiming for the passive house or Enerphit standards, but Paul Mallion suggested the AECB Silver Standard instead. Paul calculated the space heat demand of the unimproved house to be an alarming 205 kWh/m2/yr, and his calculations predicted they would achieve just 36 kWh/m2/yr for the retrofitted, extended house – well within the AECB Silver Standard target of 40kWh/m2/yr. The structure of the house is of masonry cavity wall construction – with cross-walls at each gable — and the front and back walls were also of masonry cavity with decorative finishes such as tile-hanging, which had prevented cavity fill on those faces. Cavity wall buildings can be complicated to make airtight — there are more hidden gaps, and the inner leaf may not have been constructed that carefully, as it is out of sight, and not needed for weather-tightness. Paul Jennings was able to identify many of the main leakage points that would have to be tackled, including leakage through electrical back boxes, wall-to-floor junctions and wall-to-ceiling junctions. The main airtightness strategies were internal parging, including re-plastering over taped cavity closures, and membranes and taping in the timber stud extension. 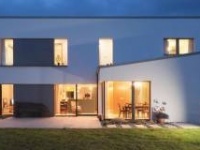 A particular challenge was posed by the fact that the existing double garage was to be bisected, with one half remaining external to the airtightness and thermal boundaries, and the inner half wrapped into the thermal envelope to form the annexe. As with most retrofits, a number of balancing acts were needed when arriving at the final design for heat loss, juggling ultimate performance against the expense of installing a measure or reconstructing the fabric, within a fixed budget. As Paul Mallion explains, PHPP really came into its own when assessing options. 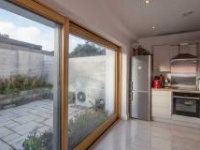 “Analysis showed that while there would have been a very significant benefit from replacing the uninsulated concrete floor, this would have been prohibitively expensive. However there was space to add between 50 and 75mm of polyurethane insulation board, and the analysis also showed this gave an acceptable result,” he says. The main insulation strategy for the walls was external wood fibre insulation – using Steico Protect – finished with lime render and weatherboarding. The part-filled and unfilled cavities were also topped up with mineral wool. The clients’ preference for natural materials meant they were happy with Paul Mallion’s preference for wood fibre insulation — he has a lot of experience with it from conservation work on historic buildings. “Wood fibre is beautiful to work with, and easy to install once you get the hang of not bashing the corners; it locks together,” he says. The roof was in good condition but the roof ventilation was upgraded, the existing loft insulation completely removed, and 300mm of Warmcel laid with an extra layer of cross laid 100mm Thermafleece sheeps wool on top. Thermal bridges (such as the cast concrete lintels that spanned the cavity walls front and back) were mostly dealt with by using the external insulation, but many complex junctions were involved in the conversion of the garage and abutment of flat roofs, requiring careful positioning of both internal and external insulation. Because the roof was not in need of replacement, it was not cost-effective to take it apart to get a full thickness of insulation right over the top of the walls. Instead, the internal eaves were treated with an insulated cornice, in order to minimise cold bridging. Instead, the clients opted for decentralised MEV (mechanical extract ventilation) units which have a declared noise level of just 10 dB. To make sure they could live with them, the clients even purchased a fan before installation, to run overnight in their bedroom. Despite the energy cost of missing out on heat recovery, Paul Mallion believes the dMEV was a good solution. “With dMEV, no ductwork is needed. The extract fans are located in each wet room and run constantly at a very low speed, drawing air from habitable rooms.” Trickle vents were placed in some windows, and through-the-wall ventilators in some rooms. “With hindsight, retrofitting ductwork for MVHR would have been very hard,” he adds. As well as adding full-height south-facing windows to the living room, it was decided to add new clerestory bedroom windows, and new glazed doors to the west side of the dining room. PHPP analysis suggested there was a risk of overheating for 2% of the year. Because money was tight, the clients decided not to add extra shading beyond the flat roof overhang at the living room. However, given the potential risk, structural timbers were included above the south windows, able to support a shade or brise soleil, which the clients now intend to install. “The house doesn’t overheat often — but when it does, it gets very hot!” Brigitte Sims explains. “But thanks to Paul’s calculations we are prepared, so adding shading will not cost much extra”. The use of renewable energy was an important aim of the clients, who wanted to live more sustainably, cut their energy bills, and generate their own energy rather than use fossil fuels. The main heat source is a 4-8kW Haas & Sohn wood stove. Over the year it provides an estimated 75% of the space heat. The downstairs is open plan, with double doors to the hall and stairs allowing heat up to the first floor. A 3.6kWp photovoltaic array contributes electricity for daytime use (including appliances and home working), and some of the PV generation is also stored as heat. A 170 litre thermal store contains a dedicated immersion heater controlled by an Immersun switching control, which ensures that whenever the solar panels are generating more than is being used in the house, PV power is used to heat the water. A second immersion heater, on a timer, tops up the tank using off-peak electricity when required. The Immersun operates a ‘daisy chain’ cascade of switching, so in winter, if the water tank is hot and there is still surplus generation, power is sent to a set of ‘heat mats’ – electric heaters set behind ceramic tile emitters in the floor and walls of the northerly rooms in the house, including the annexe. Without detailed monitoring the Sims are not sure how much power goes where, but since a faulty unit was replaced nine months ago, the Immersun has diverted over 500kWh of PV power. The Sims are fairly low hot water users (<100kWh/month), which suggests perhaps half the hot water is solar-heated, depending how much is also passed on to the heating panels. Lighting is mostly by LEDs, and the kitchen has an induction hob. To retain gas it would have been necessary to re-route the gas main, which would have cost as much as their chosen heating system, so the Sims were happy to disconnect it instead. To achieve the standards of comfort and energy efficiency the Sims were looking for, considerable attention to detail was needed during construction. Because neither Paul Mallion nor the clients were close enough to attend site regularly, this proved a bit of a headache initially, with some details being missed. However, the solution came in the form of experienced passive house builder Antoine Constantini of Kithurst Builders, who was brought on to the team to guide the site crew on a weekly basis. This worked well — for example, the airtightness target was met and exceeded, with a final test result of 2.5 air changes per hour at 50 Pascals. But more to the point, the Sims have the house they wanted — warm, bright, comfortable, and they say, giving occupants and visitors alike a real sense of wellbeing. The house is attractive on the outside, without looking out of place among its unclad neighbours. The original spirit of the design is maintained, but where there were shabby tiles and dingy bricks, there is now crisp fresh render, and clean blocks of coloured weatherboarding. With a lot of natural light and natural materials, the interior is designed to be healthy, with minimal plastics and synthetic chemicals. The clients are very pleased with the performance of the ventilation, too. “It was so valuable having Paul make the air flow calculations, so we could ensure the right level of ventilation without any draughts,” Brigitte Sims comments. As well as showing their interested neighbours around the house, the Sims are also sharing their experiences more widely, and have hosted visits from several local Transition Towns organisations. Building type: Detached 1960s four-bedroom house, crosswall construction consisting of cavity walls at each flank and tile-hung brick/ block cavity walls to front and rear. Solid ground floor and attached garage/utility room in solid brick construction. House extended over garage to form additional bedroom and ensuite, garage converted into accessible annexe, and living room extended forwards to the south to create sun-space under a flat roof. Treated floor area as existing 97 square metres. Location: Semi-rural cul-de-sac on the Hampshire / Surrey border, UK. Bespoke weather data obtained from BRE for site, due to distance from standard weather stations and local conditions – an unusually exposed location. Front and rear walls, tile hanging removed revealing in-situ cast concrete boot lintols which would be costly to remove. Walls upgraded with 100mm Steico Protect wood fibre boards under timber painted weatherboarding. U-value: 0.249 W/m2K. Walls below DPC level insulated with 100mm extruded polystyrene and painted with bitumen, to reduce cold bridge at floor perimeter and compensate for relatively poor floor U-values. At eaves junction internally an insulated cornice formed to reduce thermal bridge. Before: 225 x 50mm joists boarded and felted. U-value: 1.692 W/m2K. Before: Concrete slab with screed and woodblock flooring. U-value: 2.166 W/m2K. U-value: 2.7 W/m2K. After: Katzbeck Fenster triple-glazed tilt and turn timber alu-clad windows and doors. Ug value 0.60, g value 0.50, Average U-value across all windows and doors 1.0 W/m2K. Fakro airtight insulated loft hatch. Before: Originally gas fired warm air ducted heating system, replaced in 1970s with gas boiler and limited number of radiators. After: Wood stove with direct external air feed. Electric wall mats and underfloor mat covered with ceramic tiles fed by solar PV. Direct electric hot water cylinder with efficient heat exchanger, and two immersion heaters, one connected to grid and one connected to the Immersun controller to prioritise solar PV to hot water and heating before exporting any surplus. Before: Original warm air heating system ducts for recirculation of air. No formal ventilation system. Reliant on infiltration, chimney and opening of windows for air changes. After: Mechanical extract ventilation system using trickle vents in some windows, wall vent in living room, and Vent Axia decentralised MEV fans in wet rooms. Internal window formed between annexe and stairwell to improve air/heat circulation. Electricity: 14 panel Panasonic FIT/hybrid 3.4 kW solar photovoltaic system. Green materials: Steico wood fibre insulation used for external wall insulation system, directly rendered using breathable Lime Green render system. Flexible wood fibre insulation used between timbers in walls and roofs. Sheeps wool insulation used in loft. 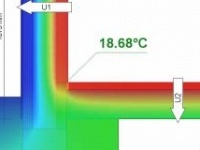 No tantalised timber allowed inside of the vapour control layer due to risk of off-gassing. Environmentally friendly paints also used.